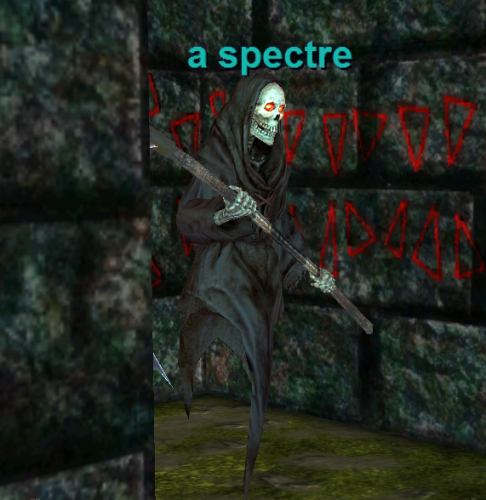 Spectres hit for a maximum of 96, and tend to attack rather quickly. They move somewhat slowly, and can be outrun even without speed-enhancing spells. They have relatively few hp for their level, which is offset by their high damage output. Their two special attacks of a stun spell and a lifetap spell also help their damage output. This page last modified 2007-11-15 09:59:44. Your faction standing with Bloodsabers has been adjusted by -10. Your faction standing with Guards of Qeynos has been adjusted by 1. Your faction standing with Opal Dark Briar has been adjusted by -1. Your faction standing with Priests of Life has been adjusted by 2. Your faction standing with Corrupt Qeynos Guards has been adjusted by -1. It's worth noting that only the specter that dropped the dirk gave faction hits the other three did not.